Norwegian police have received many reports of the mysterious lights appearing in the night sky this weekend, the local Vesteraalens Avis newspaper reported. 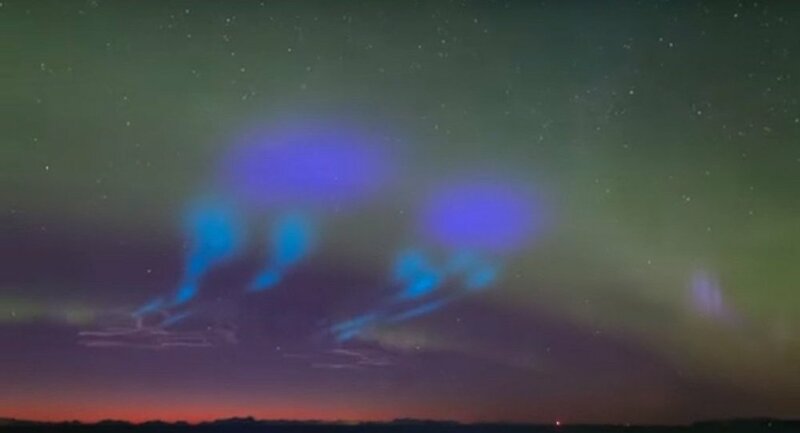 "When strange lights and colourful, expanding clouds appeared, I first did not have an explanation for", Michael Theusner, who captured a time-lapse of the footage while recording the Northern Lights, explained in the description of his YouTube video of the event. "It looked like an alien attack", he added. "Jesus Christ… sitting here and enjoying myself with a well-deserved Munkholm Light after a hectic week. Home alone and stuff… and just KABOOM!" a fellow Norwegian man, Øystein Lunde Ingvaldsen, exclaimed on Facebook, while posting another video of the spectacular display. The twin rockets were part of AZURE (Auroral Zone Upwelling Rocket Experiment), a NASA-funded experiment to learn about the flow of particles in the ionosphere. Aurorae, sometimes referred to as polar lights, are a natural light display in the Earth's sky, predominantly seen in the high-latitude regions. According to NASA, the AZURE rockets measured the atmospheric density and temperature, as well as deploying tracers such as trimethylaluminum and a mixture of barium and strontium — a combination that ionises when exposed to sunlight. "These mixtures create colourful clouds that allow researchers to track the flow of neutral and charged particles, respectively", NASA explained. ​This is only the first of eight rocket missions to be launched in Norway over the next two years. The next launch is therefore unlikely to catch locals unawares, which doesn't make it any less of a spectacular sight.